Tell me you’ve been here too: You signed up for email back in the day when it was new and easy to use. After subscribing to some websites and newsletters you got bombarded with emails that kept sneaking through your spam filters and after a few years you were bogged down with over 100 junk emails a day. So what’d you do? You decided to just nuke your Hotmail address and signed up with Gmail instead…then you saw some cool stuff you wanted to keep up with over email and the cycle has continued again. Inevitably, all the spam from low-grade email marketers over the years has made email marketing an odd place to source leads. Customers and engagement are constantly in flux because of the proliferation of digital garbage out in cyberspace. Despite a vast number of emerging platforms and services, email marketing is still one of the most popular ways to source leads. Any person or company who chooses to use email marketing knows how vital it is to understand the overall engagement of their list of subscribers. There are a number of tools available that provide aggregate measures on a single mailing – stats like opens and unique click-through rate are popular. While those single serving stats are great to see the effectiveness of one email, they fail to show the bigger picture of engagement throughout your campaign by reading engagement measures over time. By understanding your current level of engagement on a macro and subscriber level, you’ll be able to determine if subscribers have churned, or if they’re about to leave. A recent survey conducted by a consulting firm called ClickZ, found that 30% of consumers changed or created a new email address in the past year. This rate of change makes the development of key performance indicators to build an engagement index a necessary tool to determine how many of these address churning subscribers are on your lists. Here’s how to do it. First, develop your performance indicators. Rates for open, conversion, click-through, and delivery are great for short-term measurement, but they don’t provide the metrics needed to gain the long-term health of your mailing lists. Five indicators that we suggest you add to your metrics are the unsubscribe rate, spam complaint, new subscriber, and hard bounces, then add them to a quotient that directionally indicates the quality and performance of the mailing list. While each “sub-metric” can be individually measured and evaluated, they all combine to provide an engagement score that provides a better picture on your overall performance – think of it like Slugging Percentage or Passer Rating. 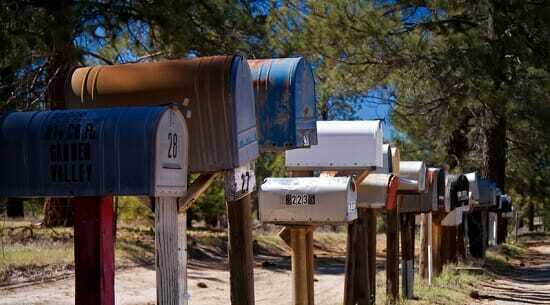 The higher the number, the better your mailing list is performing. 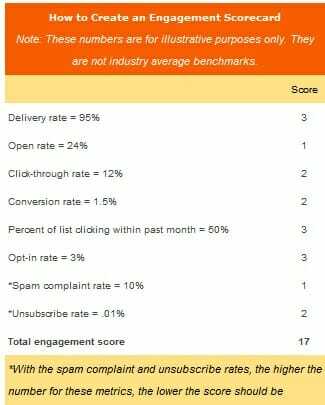 Here’s an example on what your Engagement Scorecard could look like. For this example, the overall engagement score is 17. Each measurement is easily identifiable so that focus can be given on areas that need improvement, and which are strengths. By being able to see which areas drop and rise with each email, you’ll be able to quickly adjusts your lists and your lead generation strategies so that you can get the most engagement possible. More engagements means more leads. From here you can begin to focus on subscriber behavior when creating audience segments. Create engagement rules (for example, the number of subscribers clicking at least one link during past three or four mailings vs. those clicking more frequently and those not clicking at all. This approach will create a behavioral segmentation framework to drive subsequent mailings and remarking campaigns and in turn provide an overall effective means of targeting subscribers based on their engagement. Applying this approach to reactivation mailings can help spot dormant subscribers and with the right offer, breathe new life into dying ones. This entry was posted in Lead Generation System on December 19, 2011 by Gabriel Buck.